"This book not only good to read--it DELICIOUS!" "I can't wait to read it to Rubber Duckie!" "This book is complete trash. I loved it!" Phillip Chapman (10-23-98) - Ever since early Spring, casual fans and Sesame devotees alike, have been looking forward to the release of this new book. Over 600 Sesame books have been published the past 30 years, but very, very few of them have taken a comprehensive look at the series. From this standpoint, Sesame Street Unpaved does not disappoint. The book is divided into five overall sections. Throughout the book are several pages dedicated to the main Muppet characters. These feature birthdays, scripts (with actual photos), trivia, and songs. The book also has full scripts of some of the most poignant moments on Sesame Street involving Mr. Hooper's death (Will Lee), Mr. Snuffleupagus no longer being called "imaginary," and Maria and Luis' wedding. By far, my favorite part of the book is the retelling of the scripts with "frame pictures" from the actual scenes. For the most part, these are all from the early 70's. It was neat to see the appreciation for this wonderful early material. Some of my favorites are Guy Smiley's "Beat the Time", Bert and Ernie's Banana Sketch, Near and Far with Grover, The Count vs. Cookie Monster, and Kermit's "Newsflash" segments. The biggest disappointment about the book had to do with the lack of mention and affirmation for the Muppet performers, especially those who have recently passed away. Most of the main living puppeteers (and Jim Henson) received at least a page with a picture and biography, however, Richard Hunt, one of the most versatile Muppet performers ever, was barely mentioned throughout the book. While Joe Raposo, Jeff Moss, and Jon Stone were mentioned, it would have been nice to seen them honored more as well. This is still a wonderful book and a must for your collection! We've been waiting a long time for a Sesame resource as extensive as this. You can purchase this book today from Muppet Central's Store for a significant savings. You will be captivated by over 190 rare, color pictures, scripts, stories, and songs for many hours. And out of more than 600 Sesame Street books, this one will definitely be at the top of your list. D. W. McKim (12-27-98) - Sesame Street, that wacky experiment in children's television, has grown from its humble beginnings to that of cultural phenomenon. As any soap fan can attest, a television program having been on the air for 30 seasons means much celebration, often in the form of a commemorative, coffee table style book. In this case, we have Sesame Street Unpaved: Scripts, Stories, Secrets, and Songs by David Borgenicht. There have been other books about Sesame Street aimed at an adult readership, most having been published during Sesame Street's early years. While this book is the first such authorized work, the important difference between this publication and its predecessors is that this one is much in tone with the show, fun! We can recite the skits, sing the songs, delight in the cool behind the scenes info and in the process forget we're learning because we're enjoying it! The same can not be said for all those tomes from the early '70's which were mainly concerned with the long involved history of creating the show and defining its curriculum... and then going into long detail and analysis as to whether Sesame Street's succeeded in its educational goals. You know the type; college textbook style books with a few photos included in about eight pages in the middle, a few of them even showing the Muppets. Obviously, Unpaved does touch on the story of Sesame's genesis, but it gets it over with in a few pages and moves on to what's important... the characters, the sketches, and the trivia. These are all the elements that have allowed Sesame Street to become a cult TV classic as much as an educational tool. You want Muppets? You got Muppets! While Unpaved does give due credit to the various filmmakers and cartoonists that make up the program, the main focus is the Muppets and their human friends. The way Borgenicht manages to squeeze so much into Unpaved is by dividing the book into five main chapters: Creation (Chapter One is just six pages... he knows we want to get to the good stuff), Classic Moments (in the form of transcripts, organized into sections for the main Muppet characters), Cast (that is, the humans and the supporting Muppet characters not dealt with in the previous chapter), Songs, and Behind the Scenes. But although this is how the book is formally organized, most of the above can be found in each chapter. Each section uses a variety of formats to jog our memories and introduce nifty secrets. For example, the Songs chapter in theory could easily be the most boring part of the book since those that know the songs by heart would be tempted to quickly thumb past this chapter. But along with lyric reprints, other goodies that appear throughout the previous chapters still appear such as "secret facts" and trivia entitled "Do You Remember". Along with the lyrics and photos of "Would You Like to Buy an O?" is a recap of Lefty (the Salesman's) finest moments including the ever classic "Golden An" transcript for all of those who wanted to get the correct words down! Even the choice of songs is cool... we get all the predictable standards like "Rubber Duckie" and "Sing" but then at the end of the chapter comes a section on Roosevelt Franklin's poems and even the more obscure but equally golden-of-a-classic "Fat Cat" by Mahna Mahna! Not only did I jump with joy to see it even included, but now I could actually sing it because I have the words to that manic rant! The Classic Moments is by far the largest chapter (almost half the book) but like the Songs chapter, incorporates a variety of layouts and presentations while at the same time throwing in behind the scenes trivia. This includes a rundown of the assorted props in Big Bird's nest area (including titles of books on his bookshelf!) and revelations of how Prairie Dawn got her name and who was the secret inspiration for the character of Oscar! Rather than just present page after page of transcripts, Borgenicht also jogs our memory of classic skits via "Do You Remember" comments, mini quizzes, quotes, and anecdotes. 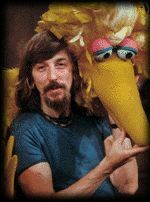 The section on Big Bird's classic moments includes his relationships with Snuffleupagus (including transcript of the classic episode where the adults see him and explanation of "Why Snuffy Was Outed") and Mr. Hooper (with its own transcript of when the adults explained his passing away to Big Bird which I dare anyone to read without getting teary). Even the section on Guy Smiley includes those other game show hosts, Sonny Friendly and Pat Playjacks! While the various seasons of Sesame Street are represented, Borgenicht wisely plans that the core readership will be those that grew up with the show and focuses much emphasis on the older classics. The episodes that the adults would remember if they weren't actually sneaking peaks at the show after grade school. I'm sure many a reader will be quite relieved to see the section on Elmo is only three pages... with the third segueing into Zoe. Though not immune from factual error (Oscar was not the second Muppet to appear on the show, Ernie and Bert were introduced before him), there are many great tidbits and facts not previously revealed in print as well as great moments that even diehard fans like myself had purged to the back of the memory. 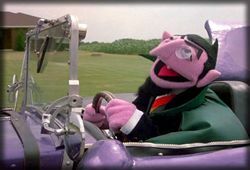 For example, Super Grover's secret identity and that the Count has actually wooed two Countesses (but he forgets to mention his infatuation with Maiden Two... so there!) Heck, we're even entrusted with what Cookie Monster's cookies are really made of! Sesame Unpaved's biggest flaw, however, is Borgenichts tendency to introduce an idea and not take it as far as it should go. Granted, only so much can fit in such a limited space and not everything can be included, but the author nonetheless often cuts himself off far too quickly. This problem literally begins in the first pages of Chapter One, where in talking about the design changes of the original Muppet puppets, considerable text is devoted to describing the first Big Bird, Oscar, and Grover puppets. Illustrating these examples are photos of the dopey-expressional Big Bird, the orange Oscar... and no photo to be found of the grayish green, browed Grover in this section nor anywhere else in the book! 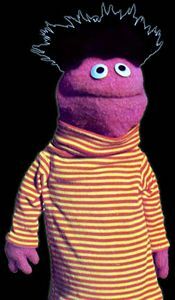 Such omissions occur up to the book's end where we have a section on the Muppeteers. To Borgenicht's credit, he does include pages on a couple of the performers who often get glossed over, namely Fran Brill and Martin Robinson. But what ends up presented is a two page spread of the Muppeteers' name with lists of characters they perform (with some error) followed by pages specifically devoted to Jim Henson, Frank Oz, Caroll Spinney, Jerry Nelson, Kevin Clash, Brill, and Robinson. Not only does it seem off that the late Richard Hunt didn't have a section, but also bordering the Muppeteers' page are photos of their characters. Why not photos of the Muppeteers? 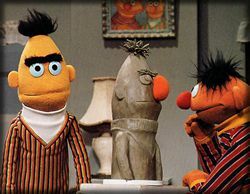 I can understand why Bruce Connelly might not have a biographical section, but couldn't we see his face in place of another photo of Ernie and Bert? 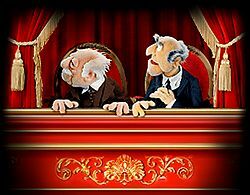 Even on page 170, where we see two photos of Muppeteers performing, there's no photo credit describing which ones they are. This snubbing of the puppeteers seemed especially glaring after Borgenicht's introduction of the human cast of Sesame Street's gushing on about how the humans take all the pies in the face and get overshadowed by the Muppets. So in place of those forgotten humans whose faces are doomed to be hidden by those pies, comes a rundown of supporting Muppet players. The section ends with the book's Greatest Idea (which also doubles as the book's Greatest Failure to Live Up to It's Promise): "Whatever Happened To...? ", a list of Muppets who have disappeared from the show and explanations of why the characters were discontinued. Terrific concept and half of it is well done with explanations of Roosevelt Franklin (although the departure of his performer, Matt Robinson, certainly an important factor in Roosevelt's disappearance isn't brought up), Don Music, and Sam the Robot. But wait! In the section on Professor Hastings, there's a photo of Dr. Nobel Price and Warren Wolf, two other characters that could have gone in this section! And what's Simon Soundman doing here? While he's not used that much, he's still on the show - we're not even told "whatever happened to him", all that appears is a quote of one of his routines. While it was great to learn why no new material was made with Harvey Kneeslapper and Don Music (yes, I fully admit that I did bang my head on the piano just as the psychologists feared the audience would do), these characters still are seen in reruns. This section certainly could have included more characters that have been completely dropped from the show like Rodeo Rosie and Deena Monster. Finally, the What-Were-They-Thinking Award goes to the section on "Doin' the Pigeon" in the song chapter. Borgenicht, in his innovative layouts, comes up with a cute idea: to present Bert's dance in a photo spread reminiscent of a cartoon flip book... but he spends six pages doing this as if he really expects people to take scissors to this collector's type book! Such an idea is much more appropriate for Sesame Street Magazine. There will no doubt be a number of children of bookowners who'll see this part and want to cut it out (many without asking their parents first thus leading to hours of hide-and-seek fun). To see pages like this wasted when they could have been used to wrap up the incomplete ideas mentioned above is truly a shame. They also could have been used to present the results of the survey questions that were displayed on CTW's web site supposedly for inclusion in this book. There were great, fun questions like "Which of the following Muppets would be the best President of the United States?" or "Kermit the Frog or Ted Koppel, who do you trust more?" These are nowhere to be found. If it sounds like I'm being hard on David Borgenicht, it's because Sesame Unpaved is overall a really fabulous book and Borgenicht demonstrates that he's capable of doing better. He obviously has much love on the show and has put much effort and research into this project. But reading Sesame Unpaved is much like reading a high schooler's 1000 word essay exam; it starts out strong knowing there's space to fill, generous in detail... and then upon realization that the deadline is approaching, wraps up very abruptly with the barest of essential facts covered. There's so much to like about Sesame Unpaved and the book is a true delight. Unfortunately, Borgenicht failed to understand the difference between leaving readers hungry for more and serving a fine seven course meal without the dessert.